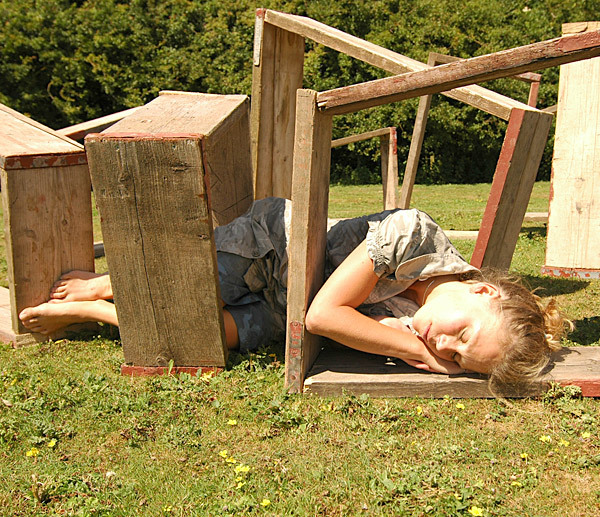 As artistic directors, Desperate Men worked with Shropshire County Council and other local authorities to develop this ground-breaking three-year project (2006 – 2009). Inspired by the River Severn, its stories and settings, the Severn Project interpreted, celebrated and explored the heritage and culture of the river and the communities that live along its banks, visiting Upton-on-Severn, Bewdley, Bridgnorth, Ironbridge and Gloucester. In 2009 we worked with Gloucestershire County Council to deliver ‘Severn Mud Larks’ in Tewkesbury, Lydney and Gloucestershire which was based around interpretations of Alice Oswald’s specially commissioned poem A Sleepwalk On the Severn. Extract from the Countryside and Community Research Institute (CCRI) evaluation report on the Severn Project. ‘Street performance (as in the work of the street theatre company Desperate Men –the Creative Producers and performers at the festivals) is an ideal art form for reaching new community audiences and expanding people’s exposure to accessible but high-quality art. Making the project’s creative producers a street theatre company working in partnership with local authority arts outreach teams and local artists who specialize in participatory outreach work means that Severn Project was highly effective in reaching new audiences and enabling audience participation in the festival host towns. The two main festivals were preceded by live rehearsals and walkabouts in order to promote the events and reach ‘non-arts audiences’. At both festivals the audience were very much part of the spectacle and unfolding dynamic of the event.